The office sector has shown signs of growth as occupancy rates have continued to increase across existing stock. New supply into the market has been limited in 2013. This is due to change in 2014 with the completion of Vattanac Capital in Q1 and GT Tower later in the year. Additional supply in 2013 was limited principally to the decline in new projects starting during the global economic crisis in 2009 and 2010. The majority of the market is still Grade C/D standard office space with a 45% and 28% share, respectively, of current supply. Grade B/B+ currently has a 27% share. Vattanac Capital will deliver Phnom Penh’s first Grade A office accommodation. The number of mid range brands entering the market has increased considerably in the retail sector across 2013. A large number of these brands were associated with food and beverage outlets, such as Costa Coffee, Swensen’s and KFC. Of these brands entering the market most have chosen to occupy standalone retail outlets, due partly to lack of availability in established shopping centers. Supply is due to increase significantly in 2014, by 142%, with the arrival of Aeon Mall. The demand for condominiums has increased significantly over the past year. Monthly absorption is increasing with most projects enjoying increased sales in 2013, with DeCastle Royal disposing an average of 9-10 units per month. 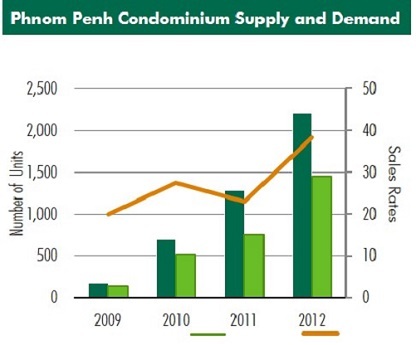 Overall there remains strong demand for serviced apartment space in Phnom Penh. This demand is set to continue into 2014, with a number of new projects due to enter the market next year. The success of new serviced apartment complexes, in terms of occupancy, reflects this continued demand, as well as the increased occupancy of older properties. The high demand and lack of supply has lead to rent increases in both new serviced apartments and a recovery in values of older stock, which dipped in 2012. Serviced apartment occupancy averaged 95% in 2013. With increased visitor arrivals and international summits such as ASEAN, the hotel market in Phnom Penh has benefited. 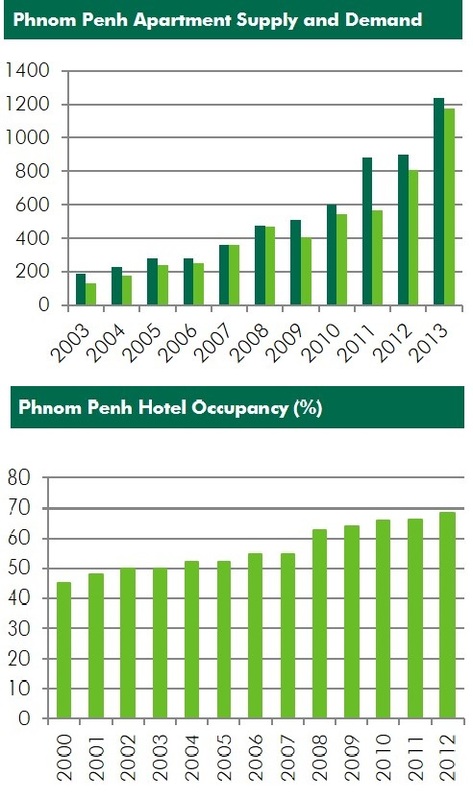 Hotels have experienced occupancy point gains with international arrivals into Phnom Penh increasing, accounting for a 20% share of all arrivals into Cambodia. International arrivals from Europe and the United States have continued to increase, as have tourists numbers from other Asian countries, notably Japan and China. The full economic impact of recent political instability, combined with the ongoing protests amongst textile workers, has yet to become clear. In the short-term, rental values appear to have remained stable. Total exports rose to $5.794bn over the course of 2013, up from $5.22bn a year prior. Trade and investment relationships with Vietnam, South Korea and Japan have continued to strengthen. Occupancy levels across the market have increased Y-o-Y. The market currently has a vacancy rate of 18% with existing Grade B stock enjoying steady absorption. Phnom Penh as a whole is starting to see large scale MNC tenants enter the market, with office accommodation pre-let to occupiers, such as Qatar Airways, in Vattanac Capital. Rents across the market have increased on average by 3% with quality Grade B space seeing a 10% annual increase. Lower grade space has seen a decline in achieved prices, with companies seeking to improve their professional image. Rental rates stand at an average of $17 per Sq.M for international grade space. 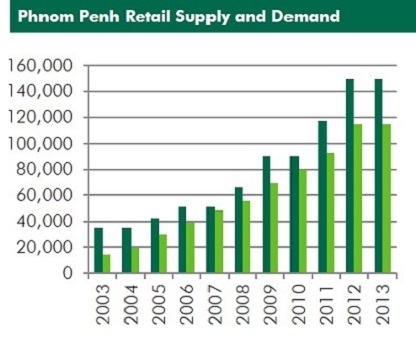 Current supply for Phnom Penh as a whole is circa 190,000sq.m (GIA). This has remained the same as 2012. Supply in 2012 increased by 5% with the launch of Yellow Tower. A further 34,200sq.m GIA of office space will be launched onto the market with the completion of Vattanac Capital in Q1 2014. Supply will increase by a total of 30% during 2014, with GT Tower set to deliver a further 15,000 Sq.M of office space. CBRE is continuing to see current villa occupiers looking to relocate to purpose built office space to improve professional image and to maximize the efficiency of their rented office space. Current supply for purpose built retail space within Phnom Penh stands at approximately 150,000 Sq.M GIA, equating to approximately 86,000sq.m NIA. Shopping centers dominate the supply of purpose built multitenant retail buildings. Phnom Penh has developed considerably in the last ten years since the opening of the first shopping centre Sorya Mall in 2003. TK Avenue arrived in Q4 2013, with supply forecast to increase to 350,000sq.m in the next four years. Vattanac Capital is launching approximately 5,000sq.m of net leasable area in early 2014, with Aeon Mall set to deliver a further 68,000 Sq.M later in the year, followed by Parkson Mall in 2015. Current demand has shown that most new entrants into the retail sector have opted for standalone retail outlets. However, this is mainly due to the lack of high quality well managed shopping centres currently on in the market. Vacancy rates in shopping centres are relatively high at 23.9%. Rents in the more established shopping centres have stabilised in recent years, with average ground floor rents are achieving $40 per Sq.M. GDP per capita between 2006 and 2011 increased by 70%. This increase has created an emerging middle class within Cambodia that now look to become the main consumers of goods on the market. 2013 has seen a strong rise in demand for new condominium units, with projects, such as DeCastle Royal achieving sales of an average 9-10 units per month. The construction market has responded to a lack in high quality condominium developments being provided within central Phnom Penh. With a number of new developments set to come online in early 2014, and through until 2016. Sales of condominiums in Phnom Penh have been heavily marred in recent years by publicized failures of developments that have been sold of plan and have subsequently ceased construction. This trend has changed significantly over the course of 2013, as a number of key projects near completion. Sales figures have increased notably compared to 2012. In the last 12 months thirteen new good quality serviced apartment complexes have opened across Phnom Penh, up from seven in 2012. The majority of which are located in the south of the city, particularly around the Boeung Keng Kang I area. CBRE have noted in the last year that there has been an increase in the number of Japanese expatriates coming into Cambodia. This can be seen by the increased number of Japanese companies entering Cambodia and opening up offices in Phnom Penh, such as the Bank of Tokyo, Mitsui and Itoshu. Occupancy rates have averaged at around 95% across 2013, with a number of properties obtaining 100% occupancy. This is a strong indicator that there is still considerable demand from new arrivals into Phnom Penh for serviced apartment accommodation. Rental rates have increased throughout 2013, with demand exceeding the limited supply delivered over the course of the year. Serviced apartment rental rates range from US$11/Sq.M to US$25/Sq.M compared to apartments with rental rates of US$8/Sq.M to US$19/Sq.M. 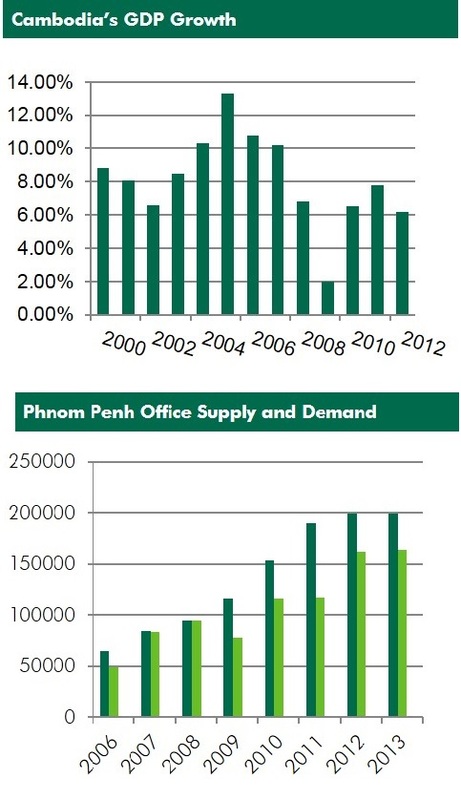 Office market supply is set to increase in excess of 30% in 2014. Vattanac Capital alone will account for 18% of the increase in supply, with GT Tower due to deliver a further 15,000 Sq.M. With the launch of Vattanac Capital Phnom Penh’s CBD is starting to take shape close to Wat Phnom. Other developments such as Hongkong Land’s Embassy Center and Acleada’s new HQ broke ground 2013, with Embassy Center due to complete in 2016. Rental rates in 2014 are set to increase, with Vattanac capital set to deliver a new record in terms of price per square meter. The arrival of new, high-quality space will likely lead to a decrease in rents of lower-quality stock. The retail market is one of the sectors with the highest amount of demand. The sector is set to change significantly over the next few years, with the arrival of Aeon Mall set to deliver a further 68,000 Sq.M of high-end retail accommodation, representing a 142% increase. 2015 and 2016 will see a further 21% an 13% increases, respectively. Rental rates for retail space in prime locations within well managed multitenant buildings are set to increase. Without improvement in management existing shopping centres are unlikely to be high in demand. The condominium sector will see a large amount of supply arrive over the course of 2014, with DeCastle Royal set to complete at the end of Q2. Demand for condominiums is increasing as the city expands with land prices increasing the domestic market will start to look towards condominiums. Pricing will become more competitive but the market normality of buying off plan is set to remain. The serviced apartment market is one of the strongest real estate markets within Phnom Penh. Although a number of units were launched over the course of 2013. The sector grew in strength with occupancy levels increasing to 95%. 2014 is set to continue to see rises in rent levels, with the main competitor to this market being buy-to-let owners of completed condominium projects looking to gain a return from their investment. High demand is thought sufficient to serve the increase in supply due to enter the market in 2014.